I rarely go to the mall, but last week I was delighted to find a store in the Treasure Coast Mall in Jensen Beach, Florida. 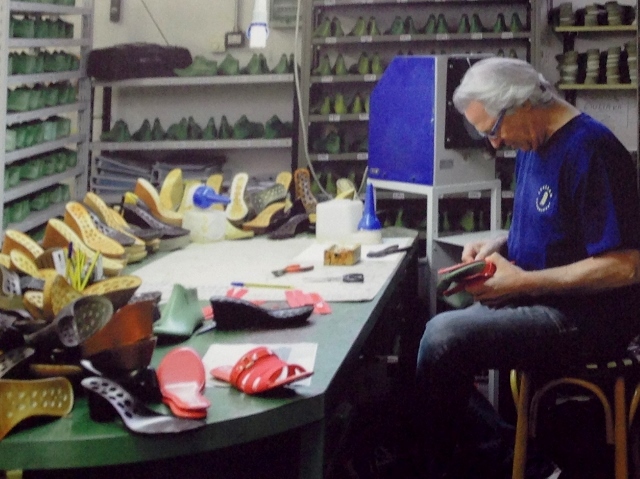 Italian Shoemakers sells authentic Italian footwear which is 100 percent made in Italy. With a name that speaks to me, how could I miss it? Of course I went inside and couldn’t have been more excited when Clara, one of the managers, spoke to me in Italian. Her ancestors are Italian on her father’s side and Hispanic on her mother’s side. She informed me that all the shoes are made in Tuscany, Italy, near Florence, outside of Lucca. Of course, the leather capital in Italy. 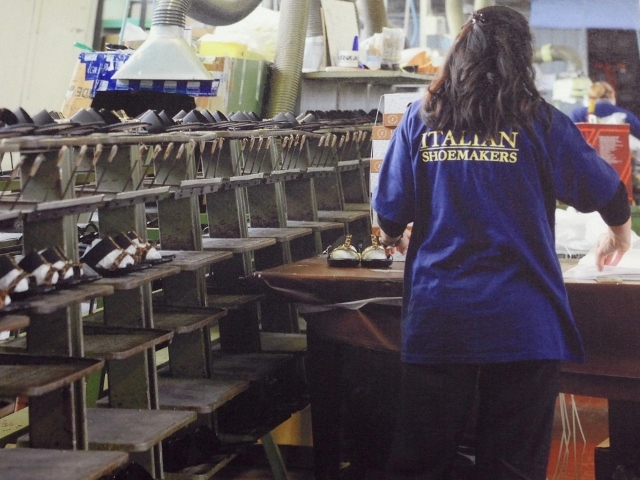 The store features photos of shoemakers working and scenes from Florence. Clara further explained that in Italy the business operates quite a few factories, although many have closed due to production that has moved to China to save costs. What amazed me the most was the cost of the shoes here. All are discounted and many were between $20 and $30. I purchased two pairs of sandals and the minute I tried them on, they were extremely comfortable. Florida operates five stores with a sales and distribution center located in Miami. 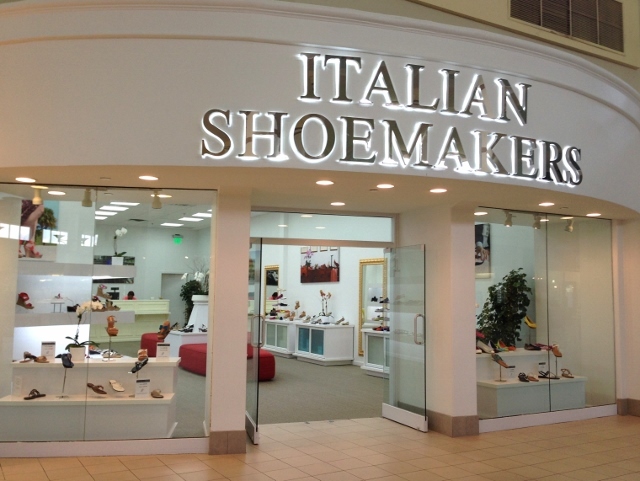 Italian Shoemakers has been in business since 1982, and their goal is quality at an affordable price. On my second visit to the store I had the pleasure of meeting Cheryl, the other manager, who could not have been more accommodating and congenial, explaining more about the company and sharing a brochure with me. I bought my third pair of sandals during this visit. 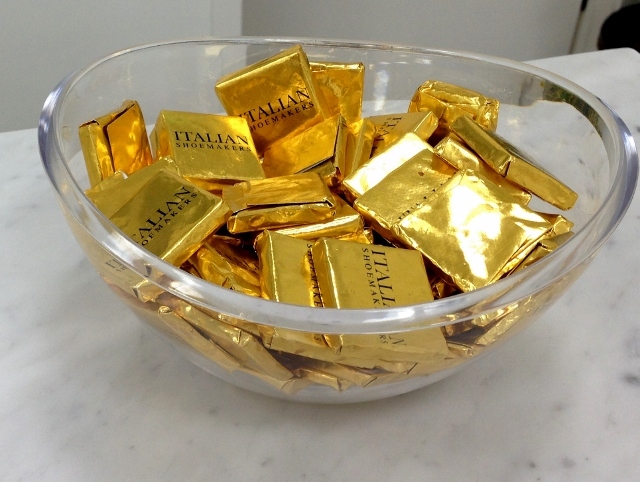 I noticed the special touches like I often see in Italy – the quality bags used to carry home my purchases, and even some chocolates wrapped in gold foil for the customers. I hope when I am in Tuscany I can tour one of their factories. It would be a real experience to see quality craftsmanship where it originated. 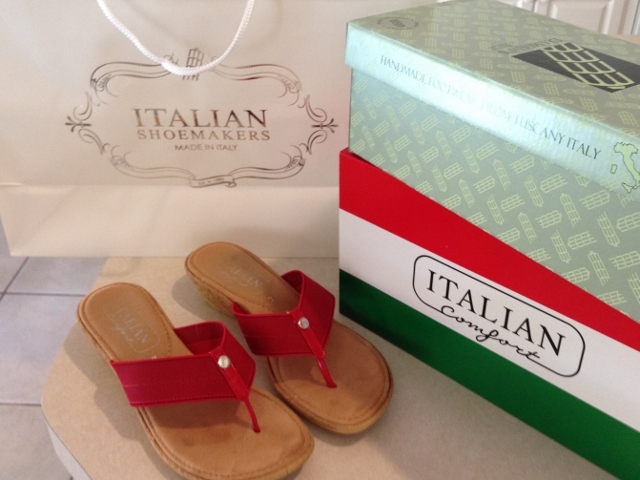 I know I will be a frequent customer at Italian Shoemakers because you can never have too many shoes, and in Florida, too many sandals. And I must say now that I have walked miles in Italy with their sandals and they were extremely comfortable and versatile. I think now I own at leat 20 pairs of Italian Shoemakers sandals and shoes and they are definitely quality made in Italy products. I also see that the company has grown and the shoes are now available on Amazon and in other retail outlets. I’ love to hear your thoughts, so please leave a comment. Wow!! How lucky can you get. 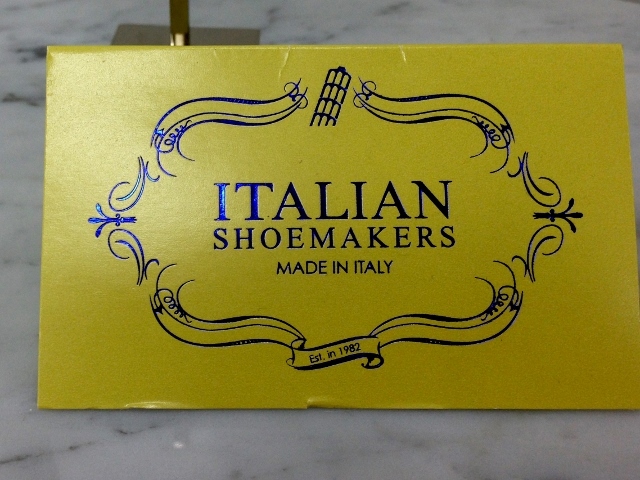 I have worn Italian shoemakers shoes for approx. last ten years. I can also say that they need to be comfortable and stylish or I won’t own any shoe. The ones from this company far surpasse and I am always on the look out for more. Never having lived near one of these stores, I have always been so fortunate to find them in TJ Max and only this summer began seeing them in the one dept store way up here in Montana. Your feet are going to love you Margie!! You certainly are right about the importance of shoes being comfortable, Florence, especially when walking miles in Italy. Thanks for commenting. I live in sandals just about year round. These sound great – I’ll have to look for the brand next time I need new sandals. this is worth a drive to florida! Lee, you are so right. Then I’d get a chance to meet you in person! Do they have a catalog? I see two sandals that I really need. Yes, I need them for sure. Bonnie, I do not think they have a catalog or sell online. Their brand can also be found at other retail outlets though. Oo la la sandals. 🙂 this is a great post. Thanks. When we are in Tuscany next month I will be checking into a possible tour. Grazie K – I like the idea of taking a tour too. Please keep me posted if you do. Lovely looking shoes. It is a sad reality that many ‘Italian’ things are now made in China. I so agree with you Francesca. Thank you for stopping by. Do you have the address of the factory near Lucca? I would like to check it out. Perhaps we can do it together. Do they only sell women’s shoes? Can they be purchased online? Unfortunately, Tony – They only make women’s shoes, as far as I know. Love this post Margie! What a great find….the photos are so attractive. Makes me want to take a flight to Florida!! I agree, those are some great looking shoes and it sounds like was quite a lovely experience! UhOH! Two of my weaknesses – Italy + shoes! So, say Italian shoes and I am there! I see that Famous Footwear carries their brand and there’s one not too far…another UhOH! This is so great to know! 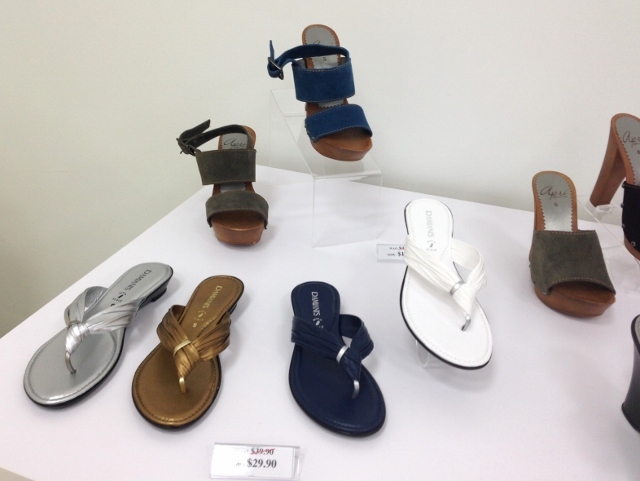 I love the photos you took of the shop and the sandals are all so cute. I like the special touch of the chocolates (great idea!!). I hope you get to visit their factory in Tuscany when you go to Italy. Awesome post and find Margie!! A lil Italy near your home 🙂 Yay! Thank you Dorcas for commenting and following my blog. Welcome! i want to see the shoes can you send me a picture of them. Italian shoemakers can you send me a picture of the sandals shoes.